Today Helston is best known for its Flora or Furry Dance on May 8—it is the ‘quaint old Cornish town’ of the well known song According to legend, the people of Helston dance through the streets to celebrate deliverance from a dragon which dropped a boulder-on the town, but the Cornish flora Dances are more likely to derive from pagan fertility rites. The Helston Floral Dance is one of the oldest surviving customs in the Country, and is a festival to celebrate the coming of spring and the passing of winter. Its origins are thought to be in pagan times. To the left outside the town you can see the Royal Naval Air Station at Culdrose, from where helicopters have made many daring air-sea rescues in recent years. 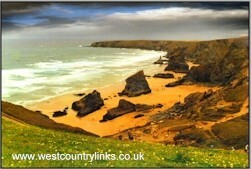 Nearby lies Mullion Cove is a beautiful cove with enormous, jagged cliffs facing Mullion Island. One mile north of the cove at Poldhu Point there is a memorial to Guglielmo Marconi, the first man to transmit a radio message across the Atlantic. his historic transmission was made from this point in 1901. On the return through Mullion a mass of aerials can be seen to the right on Goonhilly Downs. These belong to the receiving and transmitting station for satellite radio and television communications. Goonhilly Earth Station, Loe Pool (a large freshwater lake) and Godolphin House (featured in the Poldark series).